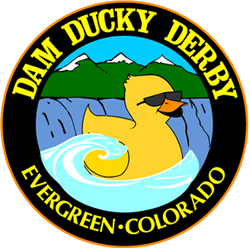 The annual Dam Ducky Derby in Evergreen Colorado is presented as a benefit for the Evergreen Park and Recreation Special Needs Program. Sponsored by the Evergreen Downtown Business Association, the Dam Ducky Derby is a fun-filled day of Duck racing down Bear Creek. This is a great family event and a chance to enjoy the Colorado foothills in Evergreen Colorado.